Rachel Turner is head of offshore for BNY Mellon's asset servicing business in EMEA, with responsibility for the firm's funds servicing teams in both Ireland and Luxembourg. She is also a member of BNY Mellon's Ireland management team. 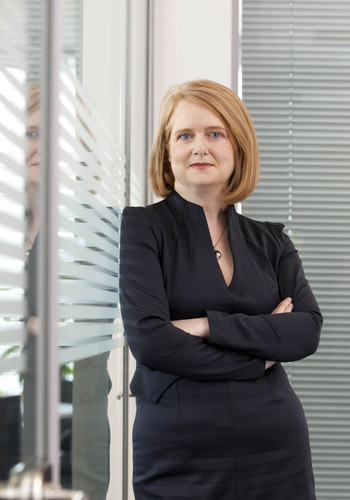 Based in Dublin, Turner joined BNY Mellon in 2000 and prior to assuming her current position in 2012, she was previously head of the company's funds servicing team in Ireland. With a career spanning over 20 years, Turner has worked at a range of firms including LGT Asset Management, BISYS Fund Services and RSM Robson Rhodes. 6.45 a.m. No need for an alarm clock in our house, when the busy four-year old stands by the bed checking if mom is up. The next 30 minutes are always a whirlwind of chaos - debates with Imogen on her outfit choice for the day, searches for Zara’s missing hockey stick, whilst trying to also find time for my husband and I to ensure we have everything we need for the day. Despite the best laid plans and outfits, it is always the same. Chaos. 7.15 a.m. The runners are on and I start my walk to the Luas. I try to walk the 30 minutes to the Luas three times a week to try to fit in some exercise. As much as I would love to go to the gym, the reality is I would very rarely find the time to use my membership. As well as getting some fresh air and exercise, walking also gives me the time and freedom to plan the day ahead and develop creative ideas to today’s issues. Some of my best solutions are created during this time. Today’s creative conundrum is on the ‘Distribution Challenge’! The distribution of investment funds cross-border has grown exponentially in recent years. Today, there are over 60,000 cross-border registrations of UCITs funds, nearly twice the number of actual funds. This poses complex challenges for asset managers from an administrative and compliance perspective as it requires a great deal of local knowledge in respect of how funds are distributed country-to-country, the differing local regulatory environments and the requirements of marketing materials. All of which can often involve a great deal of time and expense to execute. Knowing the right contacts and understanding the local market norms is critical for success. Our aim at BNY Mellon is to ease that burden for clients. I am keen to maximise that benefit for a US manager who we currently work with in Ireland, who is looking to enter the Asian markets. 8.00 a.m. At my desk and while reviewing the Financial Times, I enjoy a small breakfast and tea. A call from Michael Chan, our head of business development for asset servicing in Singapore, shortens the break and we run through a project we are working on together for a significant client. 8.30 a.m. Catch up with Tara my patient assistant. We review today’s schedule and next week’s in detail as this will be one of my regular visits to London. As the primary location of our European clients and our European headquarters, I am a frequent visitor and want to make sure I optimise my time there. 9.00 a.m. Back to my emails and also review the day's headlines from selected European media including the usual suspects here in Ireland, along with the main financial newspapers in London. I feel it is important to stay abreast of what is being covered in the news. Particularly hearing what people have to say about the Irish funds industry, the changing European funds landscape and the myriad of regulation on all corners of the world which is impacting both BNY Mellon and our clients. 10.00 a.m. Catch up with Trustees regarding our plans for AIFMD. Given the significance of this regulatory change, which comes into play in July 2013, it is a very important focus. Indeed, of the $700 million a year BNY Mellon invests in technology to support its investment services client base, around a third is reinvested in regulatory technology requirements and solutions. In respect of AIFMD and its impact on Trustees, there are a number of matters for consideration - the trustee service model will be adapted for the new directive, new specific ancillary services from our performance and risk teams are being developed, as well as client communication and engagement. 10.30 a.m. Weekly meeting with the sales and business development team in Luxembourg. I have recently assumed the position of Head of Offshore within our Asset Servicing division and as well as overseeing our Irish funds servicing team, I am now also responsible for Luxembourg and I'm getting to know my new team and learn about what our Luxembourg clients are looking for. 11.30 a.m. Debrief on last week’s prospect meeting. After each strategic meeting with existing or potential clients we sit down as a team and assess our performance. 12.00 p.m. Catch up with Tony O’Brien, Sales Partner, on our plans for his forthcoming trip to the US. This meeting always goes on for longer than expected as we strategise on the very best way to deliver our message to prospective clients in the US. 12.30 p.m. Lunch-based meeting with a US-based asset manager at our office, along with colleagues from our Alternatives Funds team, Corporate Trust and our Country Executive for Ireland, Joe Duffy. We regularly invite clients in to meet with us, or we go to see them, to have a frank discussion about their business, the industry and brainstorm ideas on how we may be able to work together in the future. When it comes to servicing clients, for us it is all about the conversation and truly knowing our client. We listen, understand and anticipate what they might need to help them to achieve their objectives. This collaborative working style enables us to take the time to get to know each client so that we can deliver the optimal solution and adapt to the changing servicing needs as and when required. 2.30 p.m. Meeting with two mentees regarding their project. BNY Mellon has a great mentoring programme. Mentees are encouraged to work in teams on projects outside their core business area, providing great opportunities to learn and network across region. 3.00 p.m. Participate in a monthly meeting with our European Innovation lead. I am a passionate believer in our focus on joining the dots to deliver cutting edge robust solutions for our client needs. At this meeting we discuss energising our Irish workforce to collaborate across businesses and regions to deliver what our clients need today, tomorrow and beyond. 4.00 p.m. Preparation for a client strategic meeting that is scheduled in London during my trip next week. We look to schedule strategic planning meetings with clients to ensure that our short and medium term goals and objectives are aligned. Using the intelligence that our broad serving team learn from daily interaction with the clients we are developing solutions that we believe address their core objective of minimising their costs and rationalising their product range. This involves strong collaboration across a number of functions and business lines. 5.00 p.m. Participate in a Steering Committee meeting - which is a bespoke project group to support the transition of assets to BNY Mellon from a particular client. So far so good, no roadblocks or matters of concern for either side. We are a big believer in planning and preparation and invest a lot of time in ensuring no stone is left unturned when on-boarding a new client, and that their experience with us is as smooth and pain free as possible. 5.30 p.m. Time to do a final review of the days emails, identifying those for priority response tomorrow. Tara has also dropped in tomorrow’s schedule and relevant papers. A quick review indicates that everything needed for tomorrow is under control, and with me having no conference calls this evening with clients or colleagues in the US, I should be able to leave on time today. 6.00 p.m. Grab a lift home with one of my colleagues. This is a great way to catch up on the broader functions that we provide in Ireland. BNY Mellon is committed to Ireland and over the years a number of other business lines such as Depository Receipts have established operations centres in Ireland providing career opportunities for staff to broaden their financial services knowledge. 6.40 p.m. Greeted by two happy girls, delighted to see mom, although after some hugs I am quickly abandoned for the TV. My husband and I share the dinner preparations. 7.00 p.m. We all sit down for dinner together and catch up on the day. The TV, Blackberry and mobile are sidelined for a couple of hours unless of course play-date scheduling is required. David and I also review the month ahead, as I generally have some client evening engagements as well as travel plans we need to coordinate diaries very tightly. 9.00 p.m. With the bedtime routine completed, sitting on the couch I catch up on some US emails that need attention. I am quite pleased to see that some of the discussions that Tony and I had earlier in the day have already started to bear fruit. Our team stateside work very closely with us to identify clients who already have offshore funds or are interested in establishing business in one of our offshore locations. Providing experience and knowledge in the early stages of discussion is important to our sales strategy and Tony and I are heavily involved in such discussions. 10.30 p.m. I love to read before sleeping but need to watch the clock. Our latest book club read is addictive so need to make sure I switch off the lights by 11.00 otherwise the 6.45 wake-up bunny will come far too quickly.